Hi Ice, your questions are not amateurish, nor are they selfish. Let me address them. The plant material and talisman water are specially blessed and possess purifying or warding properties. They are used to cleanse oneself of malign influences. Lacking an altar does not mean a lack of divine protection. Nor does possessing an altar guarantee it. The deities select as their godchildren people whom they see as being in need of extra TLC. Perhaps the person might be sickly, or prone to being disturbed by evil spirits. Godchild status is rarely lifelong, if ever. When the person improves to the point where they can fend for themselves, their godchild status comes to an end. But this does not imply total abandonment. If you lack the second sight, you can generally only see spirits if they make themselves visible to you, or if your spiritual wavelength resounds with theirs. The latter can happen when you are ill, depressed, and so on. If you have the second sight, you can see spirits regardless of whether or not they permit you to see them. This is obviously quite problematic. Spirits are usually quite happy to keep themselves to themselves, knowing that harming humans will land them in serious trouble. But there are always the desperadoes - they're not called malicious for no reason. The gods don't care whether or not you believe in them. Devotee or non-devotee, they will protect you all the same. Such is their sense of duty. Thanks for the informative reply nacht! No, Er Lang shot the monkey with magic arrows after his (Er Lang's) hunting dogs cornered him (the monkey). Can write more about the godchildren status? How do we know when one become the godchildren and when the status expire? Well, there isn't very much left to add, apart from the fact that a deity's godchild has to closely adhere to whatever taboos are associated with their godparent, attend their house of worship regularly and perhaps even be issued certain talismans or other blessed items. 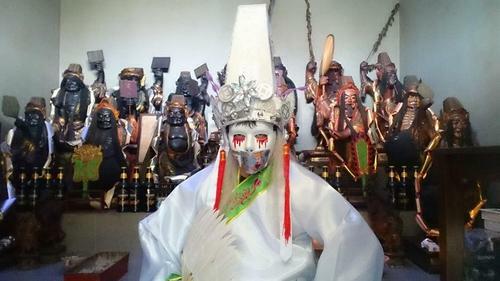 Godchildren sometimes even dress up as their godparents during festival days as a form of honouring them - take this boy, for instance, who is a godson of Ji Gong. Unless you were a baby or a young child at the time and thus can't remember anything, you definitely would recall becoming a godchild, for it usually involves a fairly significant ceremony in which you would undergo the relevant rites in the presence of the deity-in-their-medium - see below, where Tua Ya is looking over a child whom he will be adopting. The events marking the expiration of the status would be similar, if lower-key. Up for an artistic Buddha statue. Thai royal batch. Where is this place selling the TLYP amulets? Phra phrom amulet shop at FLS level 1. Thank you. Their amulets quite ex though. I prefer the one at L2 corner shop near to the bridge leading to Rocher centre. The prices there still can be negotiate. Forgot what's the name though. Some religious scholars have drawn interesting parallels between Guan Yin and Mother Mary. Too bad, he is not of Catholic denomination. I also have drawn interesting parallels between Yahweh and Brahma and he get pissed whatever I bring that out. Is er lang shen most powerful god in mma? What deity to pray for love luck? why minimum need 10 yrs. btw i never hear before asian reincarnate as ang moh or vice versa. is it because ang moh christian?